Protect trees from deer rub this Fall season. 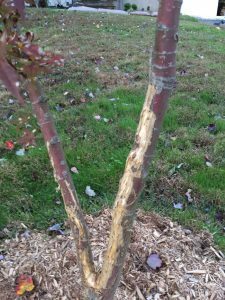 Have you noticed deer rub damage to your trees? Tree damage by deer is common in communities with large deer populations. The tree damage occurs during rut season or deer breeding period. Also referred to as deer antler rub or buck rub, the damage can sometimes be extensive. 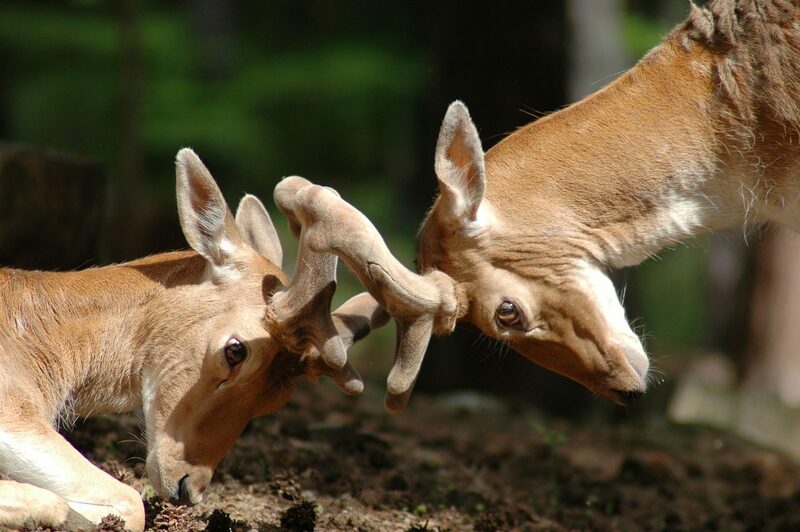 Deer rub occurs when male deer rub their forehead and antlers against a tree trunk. Smaller trees seem to be the main target of this seasonal behavior. Male deer are also called stag or buck. This is why tree damage is also referred to as buck rub. Deer rub or Buck rub is common during the rut season. So, the rut season includes the entire deer breeding season which begins in early Fall. The beginning of rut season is usually as the buck sheds the velvet from their antlers. And the end of rut season is when the buck sheds their antlers. 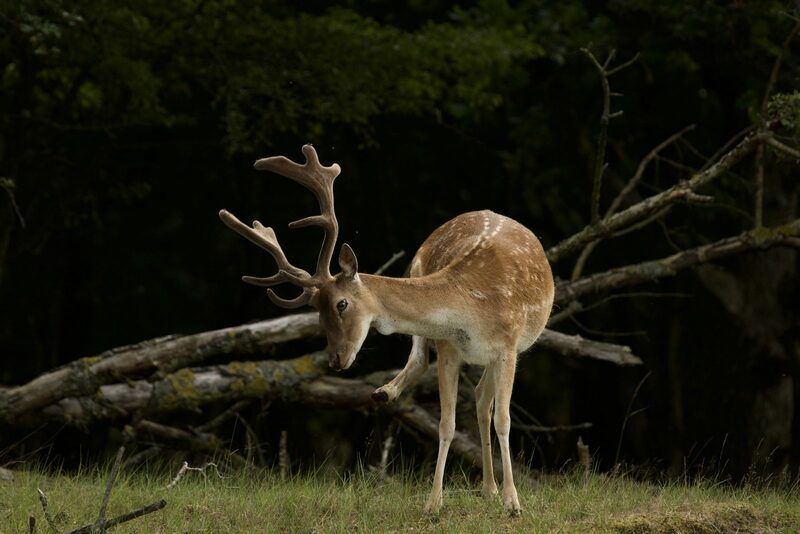 Bucks deposit their scent by rubbing their antlers and forehead on a shrub or young tree. Several bucks and even does (female deer), may use the same area. This activity occurs over the evening hours beginning in the Fall. Typically the tree damage by bucks rubbing their antlers on trees occurs midway on the tree trunk. You notice vertical scrapes and shredded bark on the tree trunk area. The bark appears to be peeled away or stripped from the tree. The inner wood of the tree is exposed and unprotected by the bark. As Winter approaches and temperatures drop below freezing, the young tree is at risk of severe damage. This photo above shows the damage to a white Dogwood tree. The young 5 to 6 foot dogwood has some of the inner wood exposed. This damage leaves the tree in a vulnerable state unless the tree wound can be repaired. This photo above shows the damage to a young Japanese Maple Tree. The Japanese Maple was not protected from deer rub. Rubbing their forehead and antlers against a tree, the deer or buck can severely damage a tree trunk. Early in the rut season, the intense rubbing by deer removes the velvet. The velvet covering the antlers is a soft membrane or layer of skin over growing antlers. Bucks routinely will return to the same location year after year to remove their velvet. Another reason bucks rub trees is to mark their territory with their scent. The scent attracts females during mating or rut season. Also, the scent warns other bucks to stay clear of the area. Take note of any broken branches and peeled or stripped tree bark on trees. Because this will be a strong indicator that the bucks are marking their territory. Be on the look out for potential tree damage to other trees in your yard. The image above, shows a tree guard wrapped around a young tree. The tree guard protects the young tree from deer rub. It is made of plastic mesh that deer are unable to penetrate. The plastic mesh tree guards are available in rolls in several lengths. Plastic Mesh tree guards can be found in hardware stores, garden stores, and home improvement supply stores. Avoid deer rub tree damage to young trees by wrapping a tree with a tree guard. Tree guards protect the trunk of the young tree. Protect trees from injury due to buck rub. If you live in a community with a large deer population, apply tree guards to all young trees. Tree guards are made of metal or plastic. A variety of sizes are available at lawn and garden stores. Apply tree guards to trees right after they are planted. At the latest, attach the tree guards prior to rut season. Avoid tree damage from deer rub during the Fall and Winter months. As Winter continues, food sources from green plants become more difficult to find. Deer and rabbits may begin to chew on tree trunk bark from younger trees. Young trees left without bark are at risk of severe damage as temperatures drop. If inner wood is exposed to extreme cold temperatures, tree survival is at risk. Install garden fencing around the tree trunk. This option protect trees from deer rub by making trees inaccessible to deer. Garden, deer, or other fencing installed around the tree trunks prevents the deer from reaching the trunk. These barriers makes access to the tree trunk impossible. Install a 6 to 8 foot tall fence for tree protection. If you have multiple trees, a woven wire fence around the entire area offers better protection. Deer can easily jump smaller fences. An 8 foot fence is needed to prevent deer from jumping over. However, deer typically do not jump over 6 foot fences that they can not see through. So a cedar or vinyl 6 foot fence may be enough to deter deer from jumping over. Wrap the tree trunk itself with chicken wire or a type of plastic tree guard. Chicken wire blocks the deer from reaching the tree trunk. There are tree guards that are made of mesh plastic netting. There are also tree guards made from vinyl spiral that wraps loosely around the tree trunk. The loose fitting vinyl spiral tree guard allows room for growth. The vinyl spiral can be cut to any length to fit over the young tree. 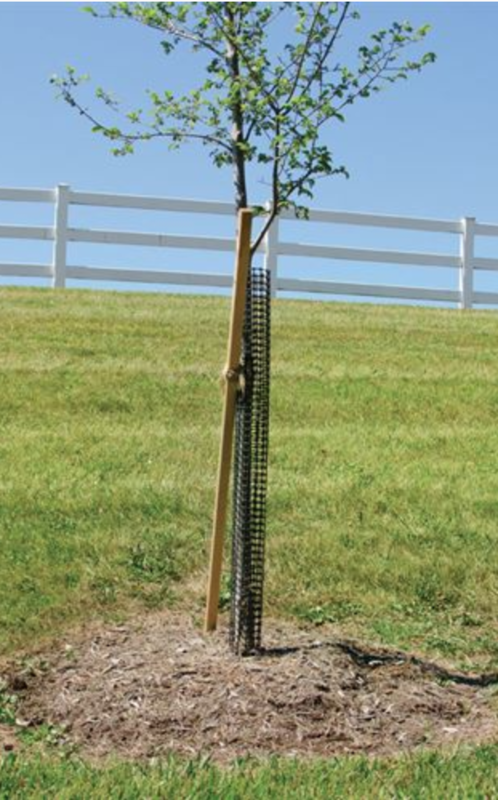 The cut to size convenience makes this tree guard an easy solution for tree protection. Use plastic tubes or pipes as a tree guard. Cut tubes or pipes lengthwise for fitting around tree trunks. Plastic tubs or pipe guards are best suited for younger, smaller trees. Use a white or light colored plastic for tree trunk protection. Darker color tubes and pipes may produce heat from the Sun. The heat could be transmitted to the tree trunk and potentially harm the tree. Tree trunk wraps, tubes, and pipes also protect trees from sunscald. Sunscald happens when the warm sun is reflected off the snow on to the tree trunk. This can cause blistering or cracking of the tree bark. Wrap shrubs in burlap to protect them from frost and deer rub damage. 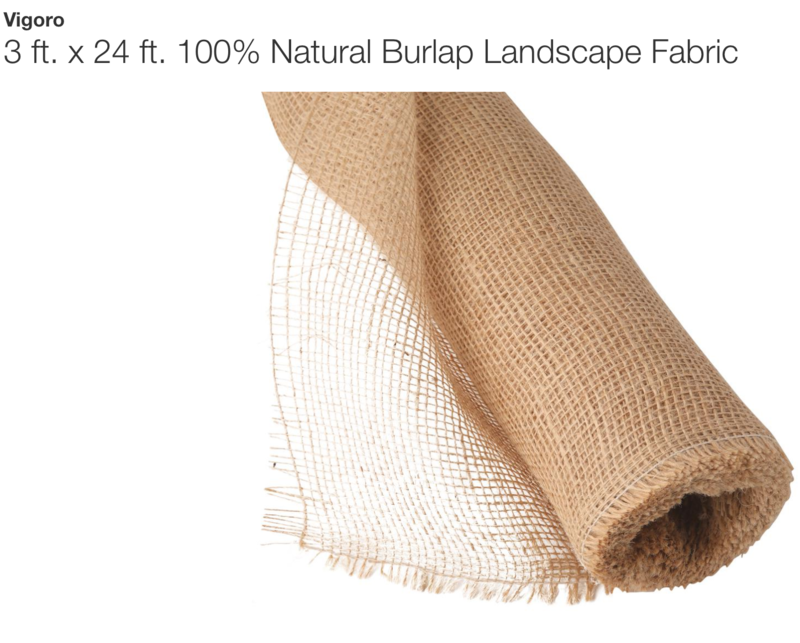 Burlap wrapped shrubs are not exposed to any wildlife or weather conditions. Shrubs will be protected from deer browsing, deer rub, cold winter winds, and fluctuating freezing temperatures . 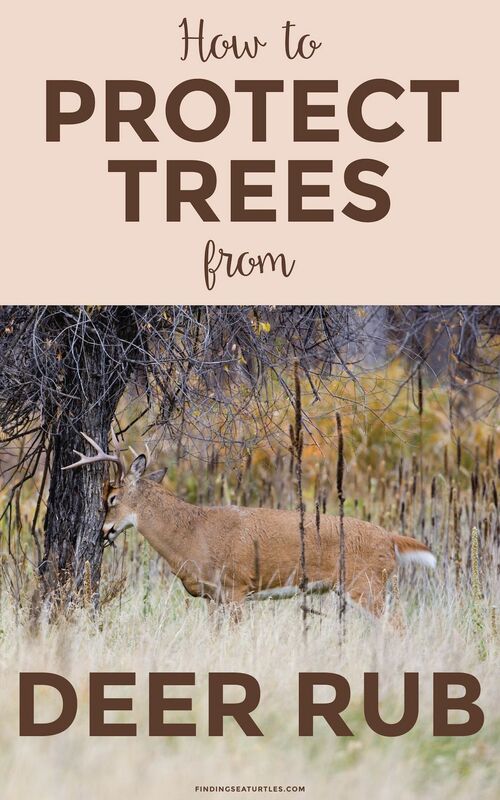 These are 6 preventive methods to protect your trees from the damaging effects of deer rub. 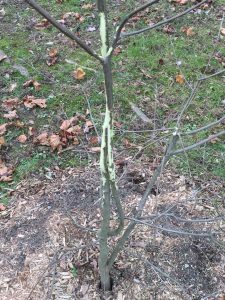 Use these methods to protect trees from deer rub before the Winter temperatures further damage your trees. Consider any of these 6 preventive methods for protection so that your trees remain healthy and strong. If you have some tips that you’ve found to be effective to protect trees from deer rub damage, please let us know. We would love to know what your tree protection methods are. And if you try any of these protect trees from deer rub options, let us know how you make out in the comments below! Thanks for stopping by.